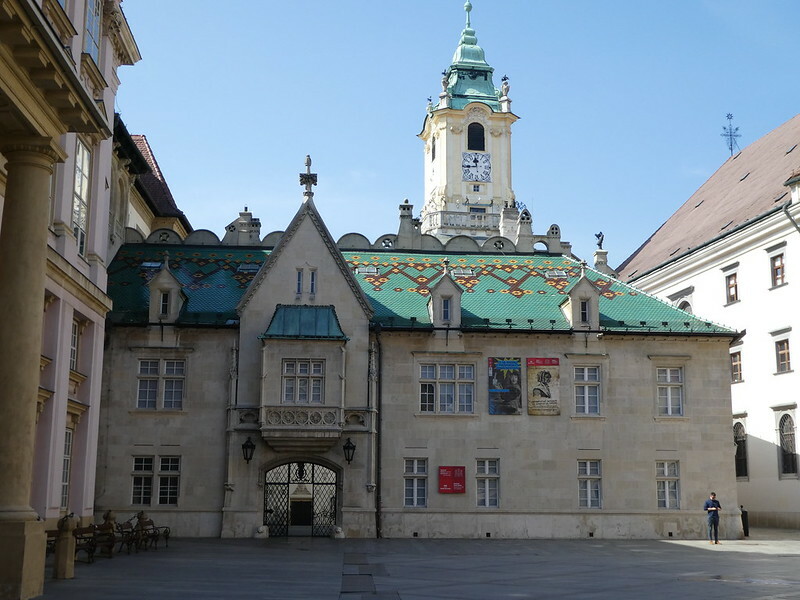 On noticing that Ryanair had introduced weekly flights to Bratislava from Leeds Bradford Airport we were tempted into a weekend break in the Slovakian capital. Dragging ourselves out of bed at 3.15 am to reach the airport in time for our early 6.45 am departure wasn’t great but the upside was that we would be touching down in a new destination at 10.10 am giving us a full day to explore the city. Arriving into Bratislava’s modern terminal building ten minutes ahead of schedule we bought a 7 day travel pass from an automated machine. At first it was hard to figure out what we needed as there was only an option for single tickets or day passes, but a second try at tapping on the day ticket option revealed a further selection, one of which being a 7 day ticket costing €11.40 each. We actually only needed four days but this ticket was better value than a three day and a one day option. The ticket was a flimsy small piece of paper but only needed to be activated on the first journey and could then be put away for safekeeping. Please note that if you are buying transport tickets from the airport that only the machines inside the Arrivals Hall accept card payment, the machines located outside by the bus stop are cash only. It was a bright, sunny morning and we waited about 10 minutes for a bus to the railway station (No.61) remembering to validate our ticket on entry. This journey took 20 minutes from where we transferred to a modern tram (No.1) for the short ride to the edge of the old town. 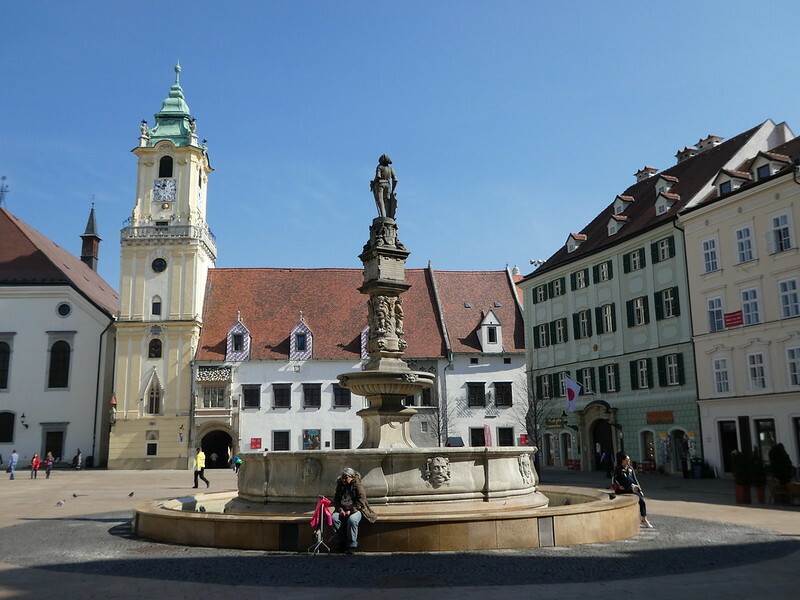 Our first impressions of the historic old town was one of delightful old buildings on cobbled streets leading to the main square. It seemed quiet with just a handful of tourists around and very few locals. Spotting the Tourist Information, we called in for a map then decided as it was noon that it was time for some lunch. Just off the main square we found a typical Slovakian beer house and ordered a couple of beers with sausage and pickles. Our snack tasted good and sitting in the pub gave us an opportunity to study our city map and get our bearings. Setting off, we looked out for some of the ‘Men at Work’ brass sculptures which are to be found scattered around the old town. 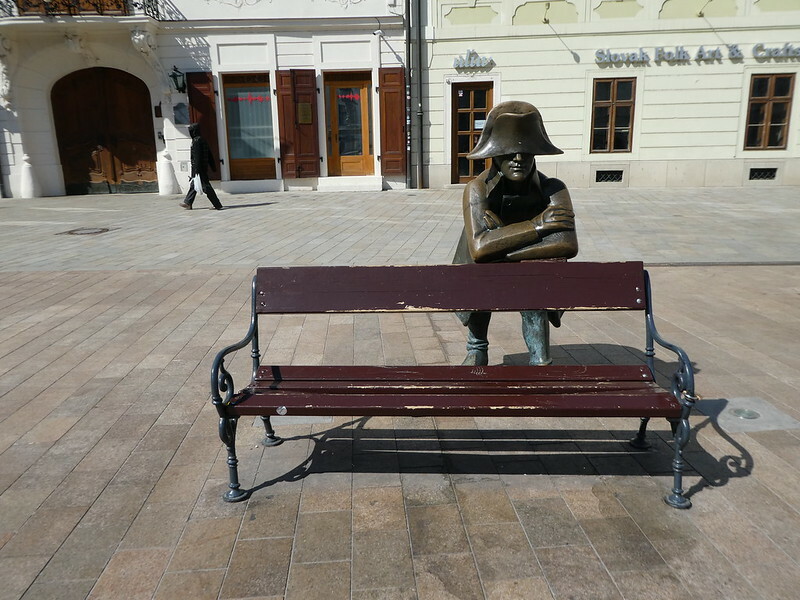 The first we came across was of a man taking a rest and leaning over the back of a bench in the main square. 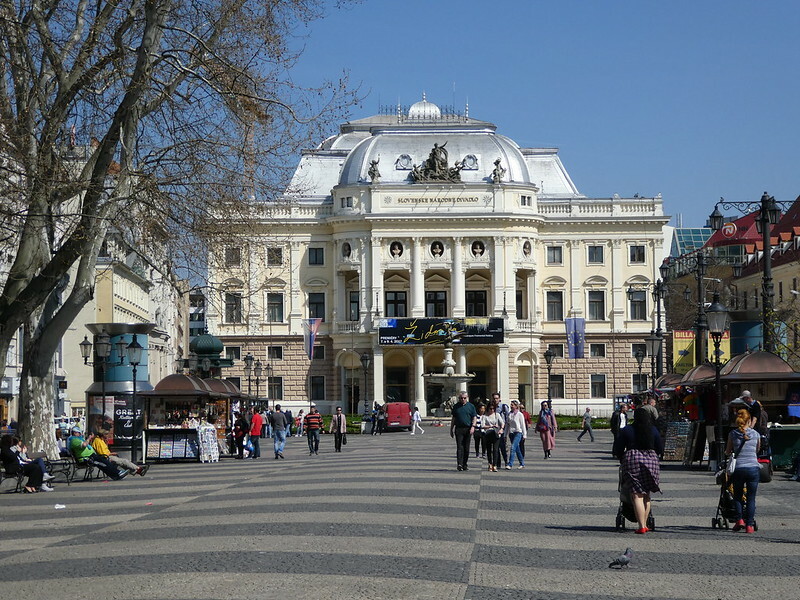 Strolling towards the Slovak National Theatre we passed several others, our favourite being ‘Cumul – the man in the sewer’ who even comes complete with his own road sign! 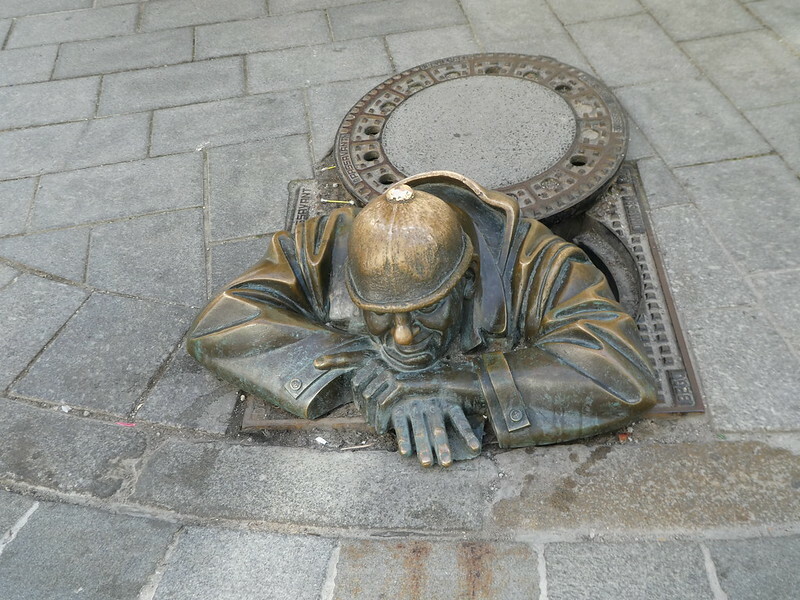 Passers-by could easily trip over this pavement sculpture if they weren’t looking where they were going. 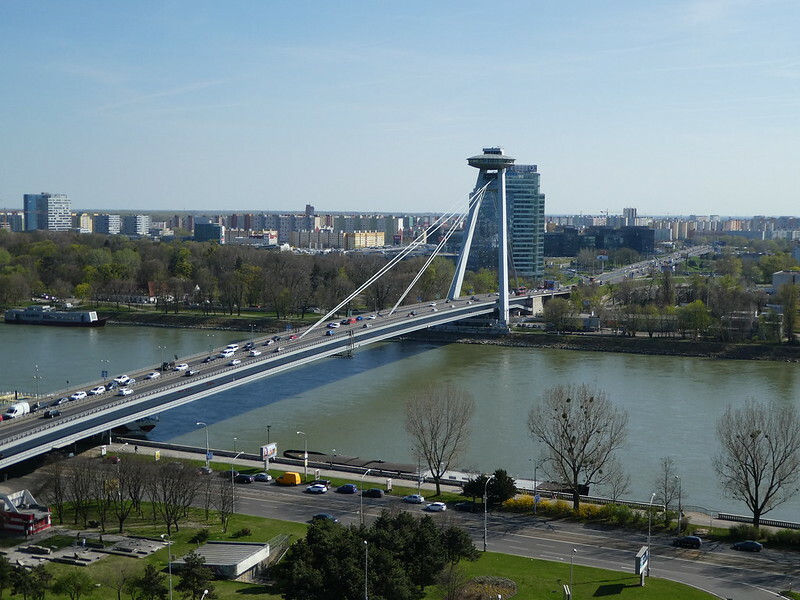 We soon reached the wide River Danube and from one of its bridges we had splendid views of the castle and the UFO Tower. As it was such a clear, sunny afternoon we decided to take the lift to the top of the 95 metre high tower. Tickets costs €7.50 each but to reach the outdoor viewing platform it’s necessary to clamber up four short flights of steps after using the lift. The views were magnificent enabling us to see across to the Austrian border, a full stretch of the mighty Danube and several of its bridges. Descending the stairs we came to an inviting cafe/ restaurant with panoramic views over the Danube and decided to stop for pots of tea whilst soaking up the views. 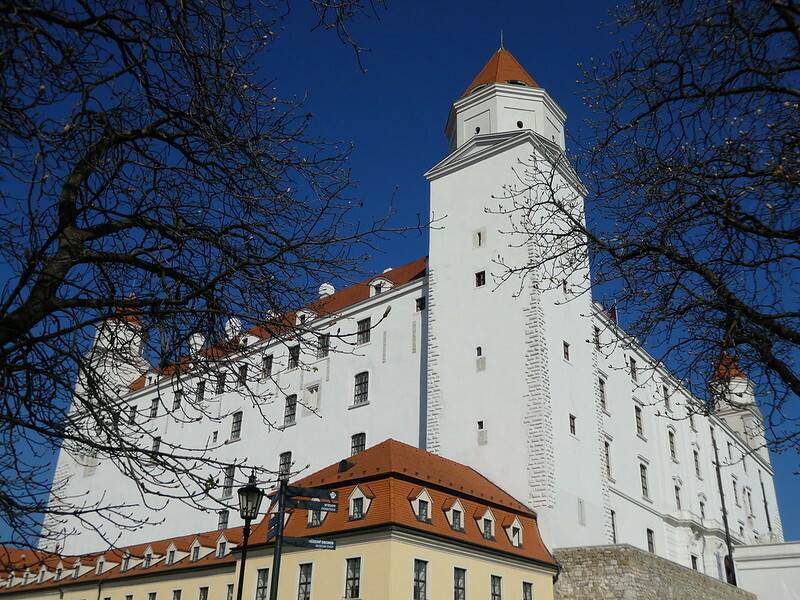 After a short rest and a chat with the waiter we returned down the tower and crossed the Danube once again, this time heading towards Bratislava Castle. It was a steep uphill walk and then several flights of stone steps until we reached the castle lookout points, the clear blue sky providing us with far reaching views. From afar, the castle appears quite large but seems much smaller when up close. Several Viking River Cruise tour groups were looking around, the flat topped riverboat moored directly below probably belonging to them. It had now reached 25 degrees and we’d been wandering around with our weekend luggage all day so we were starting to get tired. A glance at our transport map indicated either Tram 8 or 9 from the old town would take us to our hotel, the journey only taking 10 minutes once we had found the tram stop. 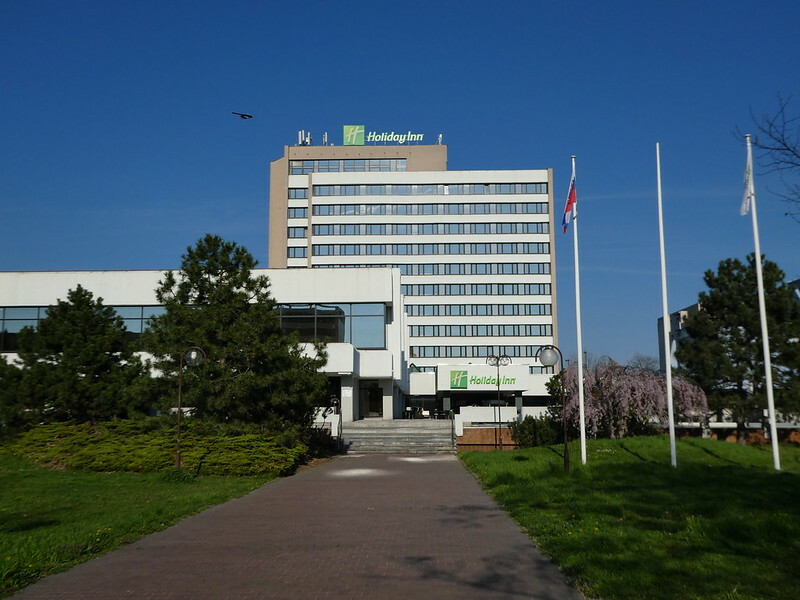 Our hotel, the Holiday Inn was about another ten minute walk from the tram and was located in a small park. We were fortunate to check-in when we did as just as the receptionist was handing us our room cards a large group of people arrived forming a lengthy queue. An hour’s rest, and several cups of Earl Grey tea with numerous shortbread biscuits later we popped down to the Wellness Centre to use the sauna and indoor pool before heading back into the city centre for an evening meal in the Slovak Beer House. Trying to select a local dish, I opted for Sheep’s Cheese Dumplings which were very tasty if a little heavy, so late at night.